Pia Freund studied at the Turku Conservatory and at the opera department of the Sibelius Academy. She is the winner of the Timo Mustakallio singing competition in 1991 and the Lappeenranta competition in 1992. She made her Paris début 1996 with the Orchestre national d´Île de France at Salle Pleyel, her London début 1998 with the Royal Philharmonic Orchestra, and her New York début in 2003 at Carnegie Hall. Pia Freund has appeared with the Drottningholm Baroque Ensemble and the Scottish Chamber Orchestra. She has performed at several festivals in Finland and abroad. 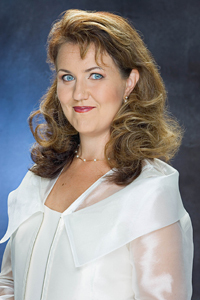 Her opera roles include Micaëla in Carmen, Pamina in Die Zauberflöte, Fiordiligi in Così fan tutte, Mimì in La Bohème and Clémence in Kaija Saariaho's L'Amour de loin.